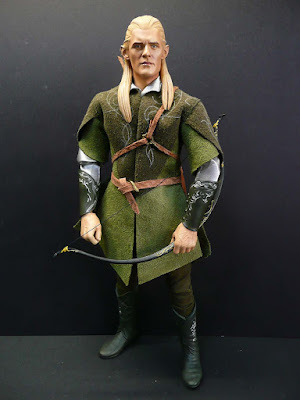 Legolas Greenleaf is the Elf Prince of Mirkwood and is introduced in "The Fellowship of the Ring (2001)", at the council of Elrond of Rivendell. 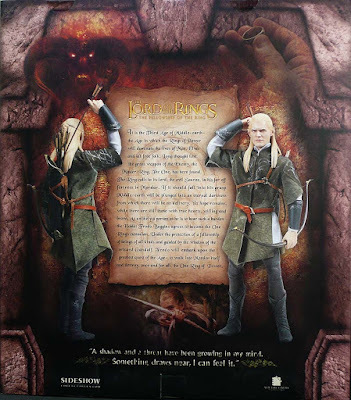 He is a friend and confidant of Aragorn and joins the fellowship that sets off to destroy the One Ring of Sauron. 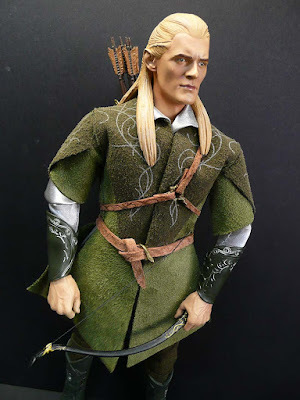 Legolas is a bowman of unsurpassed skill and his Elven eyes can spot danger far beyond the sight of mortal men. 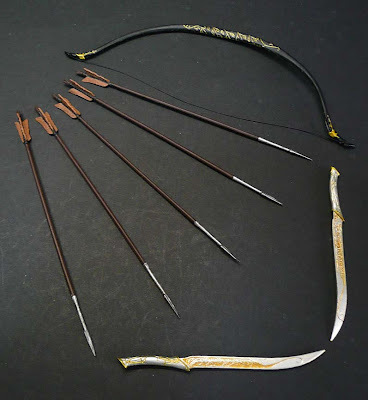 In the Orc attack on Amon Hen, he stabs one in the eye with an arrow, then pulls it out and shoots another. 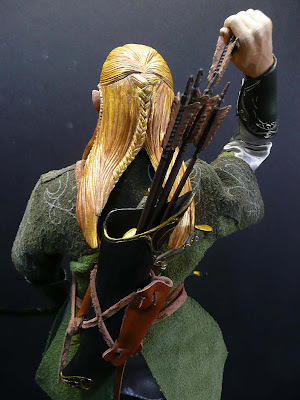 He also shoots two more (the arrow going through the first Orc and into another) with the same arrow. 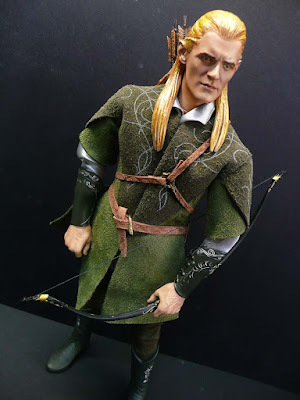 In the Battle of the Hornburg, he slides down a staircase on a shield, shooting arrows all the while, and as he reaches the bottom of the staircase he shoots the shield out from under him into an Orc neck. 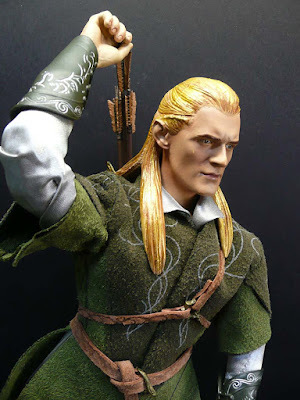 He also wields twin long knives, which he uses with lightning fast precision several times during close combat. 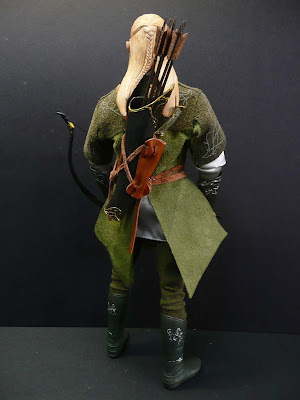 The knives, when not in use are placed into two sheaths strapped to his back in front of his arrow quiver. 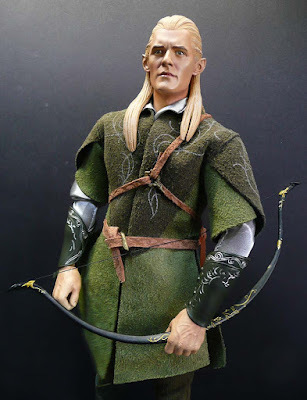 Legolas is the second LOTR figure to be released by Sideshow in 2007. 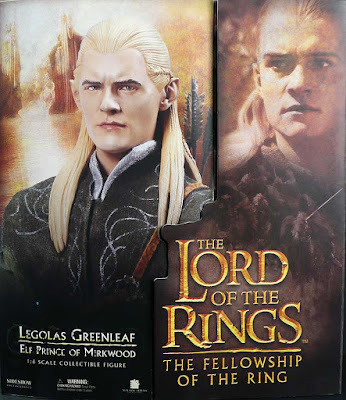 Legolas was played by Orlando Bloom (his break-through role) in Peter Jackson's The Lord of the Rings movie trilogy. 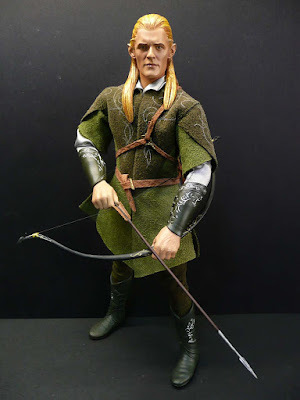 Bloom also played a brief role in the war film Black Hawk Down as PFC Todd Blackburn. 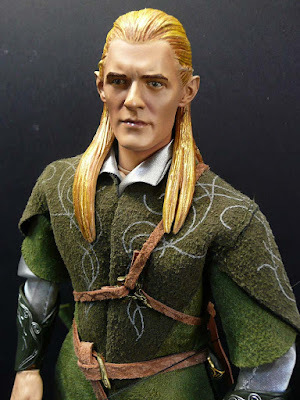 He would later play blacksmith Will Turner in the Pirates of the Caribbean trilogy, and also appear in Troy and Kingdom of Heaven. 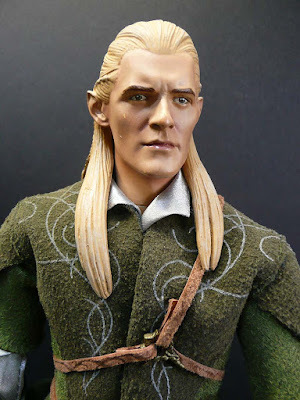 A much better head sculpt than Aragorn's but the paintwork, especially on the hair can be much much better. It's just one coat "plastered" over the head - very flat and undefined. 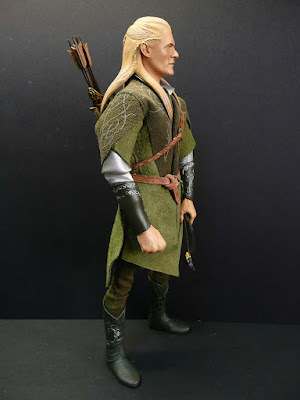 Legolas is dressed in undershirt, Mirkwood tunic, pants and boots. 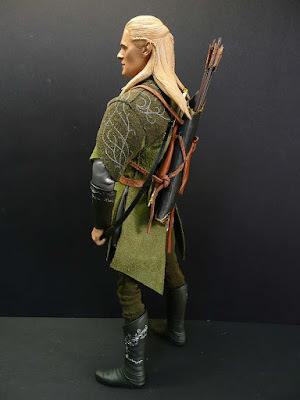 The materials used for the clothes look authentic and very nice, the same goes for Aragorn's as well.